From the Hancock County Courthouse, take Hwy 22 southwest for 7.2 miles to Devereux. Turn right (at backwards fork) onto Main Street. Go 0.2 mile to the dead end and turn left on Jones Chapel / Devereux Rd. Go 1.3 miles to Warren Chapel Road. Turn right on Warren Chapel Road and go approximately 2.6 miles to Watts Road. Turn left on Watts Road. The church is on the right side of the road. Section A is to the left of the church. Section B is behind section A to the west and northwest. 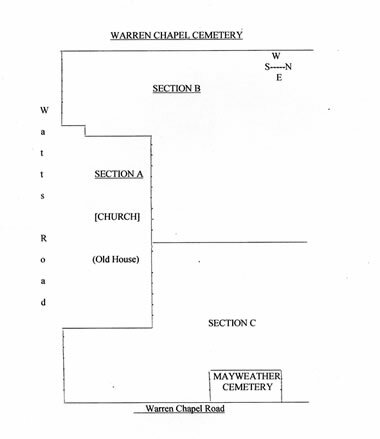 Section C is to the right of the church at the corner of Watts Road and Warren Chapel Road. Sections A and B are generally aligned in rows. Section C has no structure. Section X with graves numbered 200 or higher are graves added since the original survey and are largely based on obituaries. They are believed to be somewhere in the cemetery. 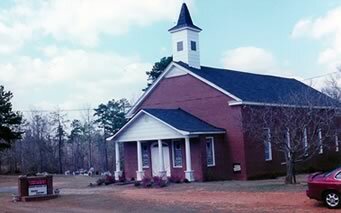 The church was founded in 1873. "A Loving Husband and Father"
"Life" "Truth" Old decorative headstone with open gates. Old slab with info written by hand. Long iron rods at each end of grave. Metal marker from funeral home - no dates. Info written by hand on upright headstone. Very hard to read. Row 9 vacant except for a few possible depressions. "Baby Boy" on each end. Adult length slab but narrow with brick in middle of length of slab. Flat headstones on each end of slab - possible twins. No dates. Unclear if Bella is her first name or last name. Gone But Not Forgotten By Wife. Old upright headstone written by hand. The graves in "row" or lot 11 are all within a fenced area. Person numbers 25 through 35 are in fenced area. All of the following graves in "Row 12" are in no set pattern. One vacant place. Person numbers 110 - 118 in fenced area. Info on metal marker from funeral home. Unmarked Grave - Aaron E.
Age 17. Metal marker from Neal Funeral Home - unable to read last name. Unmarked Grave - John Scott, Ms.
Information from metal marker from funeral home. Metal marker from funeral home - no data. Only one date of July 18, 1961 -- death date assumed. No dates. Name on concrete cross. No dates. Name on concrete cross. Last name of Hames questionable. In loving memory of EBH wife of John Harden, Sr.
"May you sleep" A concrete cross. Old upright headstone with "Sellers" (gravestone maker) inscribed above name. Age 58. Only one date -- death date assumed. Old upright headstone with open book on top. Vault fallen into ground with unmarked broken slab. Moved to Ingram Family Burial Ground. 2 graves identifiable by only the bases for headstones. Tops gone. Asleep in Jesus. Blessed sleep from which none ever wake to weep.